ABG President Chief Dr John Momis speaks on key issues that ABG is currently addressing. Momis made his first appearance for this year at a media conference held on Monday 8th 2016. President Momis, firstly wished all citizens of Bougainville a Happy New Year. 2016 will bring some big changes and improvement to Bougainville. If we look at the bigger vision of what BPA is, you will begin to see that only in Bougainville, WE have a strong government. We have the right to vote for a referendum to get independence. PNG constitution does not allow other provinces to get autonomy the same as Bougainville. PNG constitution does not allow any other provinces to get independence. This is a unique right of the constitution of Papua New Guinea. This, the Bougainville Peace Agreement (BPA) is a result of Peace in Bougainville an outcome that ended the war, a bloody war that killed 15-20,000 people. The powers, which the ABG already has, cannot be taken back by the national government. It is irretrievable. It is protected under the provision called double entrancement clause in the peace agreement. The National Government cannot get back all the powers that Bougainville has already drawn down. According to the Peace Agreement, and inline with the constitution, the National Government and ABG must work together to achieve results of the peace agreement. The two must have a joint partnership in implementing the peace agreement. This means that the national government has a very big responsibility to make available all the provision funds to operate ABG and fund services to the people of Bougainville. The national government is not at liberty with all funds. When doing so, the national government has broken the constitution and the peace agreement. ABG has a lot of power under the Bougainville Peace Agreement. But because we don’t have enough knowledge and experience all these powers are not in use and are not functioning. When we have enough educated people and if we build capacity then all powers will function and the people will see the results and outcome of the true meaning of drawing down those powers. But before that can happen as well, the government (ABG) must make new policies and laws. Having draw down of powers without policies and legislation will not bring out any results. And they become non-existent although already existing. This is a big problem in Bougainville because there are not enough educated people with experience in law, planning, and finance to make new policies. This means that Bougainville must have a lot of educated people who can make laws to encourage new ideas. ABG’s biggest challenge is not having enough human resource that is equipped with a capacity of creating new laws and policies that can move the region forward. The National Government is breaking the law when it is not meeting all the funding under the Bougainville Peace Agreement that is suppose to compliment the functions of the Autonomous Bougainville Government. This is a controversy to the constitution of the National Government and the Bougainville Peace Agreement and the leaders and people of Bougainville. ABG is not begging the National Government for money. The National Government owes ABG money. Before the crisis, Bougainville was the main income driver for the National Government. Contribution from Bougainville to the National Government was tremendous. And so, the action of the National Government shows that the government has no gratitude of Bougainville’s contribution in the past. The Autonomous Bougainville Government will raise this issue again at the Joint Supervisory Body (JSB) meeting that will be held on the 15th and 16th of February. JSB is a special meeting held between the National Government and the ABG to address and resolve critical issues raised by the ABG to the National Government and from the National Government to ABG. It is a special meeting held between both governments to negotiate inline with the peace agreement. We hope that there is already work done to resolve a lot of issues faced by ABG. President Chief Dr John Momis elaborated on the five principles of his government during his first term as the president for the second house of government in 2010. 1. Unification of all Bougainvilleans. 2. Securing the political future of the Bougainville Peace Agreement. 3. Promoting Good governance in the rule of law. • The outcome of the referendum will be difficult to achieve if their is no unity. The outcome of the referendum will be a result of the two governments (GoPNG and ABG) consulting each other on the outcome. • It means that for unity to take place, we must agree to become a member of a team. • Unity means encouraging a lot of debates on referendum in Bougainville and PNG. • Encouraging ABG to archieve complete autonomy. ABG autonomy is 90% of Independence. • Preparing Bougainville for referendum. • Accepting and upholding a democratic system of government. • Upholding the constitution and law and order and not agreeing to the traditional or customary way or any other way of upholding the law. • The media and NGOs must not confuse the public with wrong information. • It refers to ABG having dialogue discussion with the people of Bougainville and the government and PNG. • For both ABG and GoPNG to jointly implement the peace agreement. 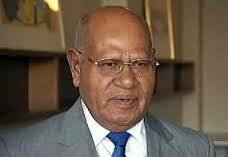 President Chief Dr John Momis urged for every citizen to take responsibility with their lives. • Go to church and have a strong relationship with God. • Be concerned about issues in your local area, community, and societies within your constituency, other constituencies and around Bougainville. President Momis made other announcements. • This year there will be more trauma counseling programs under the UN Peace Building fund in Bougainville. • ABG will have funding to implement economic programs tailored for people who can become self-reliant including the government. • ABG will approve the new Public Service structure for Bougainville this year. All positions will be reviewed, approved and advertised. • The Bougainville Peace Agreement (BPA) is now known as the model peace agreement in the world.